Pride of Spitalfields, Aldgate. 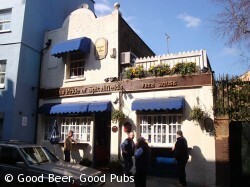 Note the very old-style Fullers branding high up on the front of the pub. Small, cosy pub – well hidden just off Brick Lane. The pub has a real ‘locals’ feel but is nevertheless welcoming to strangers and is often heaving when other more modern outlets nearby have few customers. As well as the selection of well-kept real ales – including Doom Bar and Crouch Vale Brewers Gold, the food is pretty good too. This was a regular lunchtime stop when I worked in the Aldgate area.